The Write Markets Report - 11 ISSUES PER YEAR! ONE YEAR (11 issues) of the newest paying markets for writers! Ebook $4.95 Download Ebook instantly! 11 issues/year! 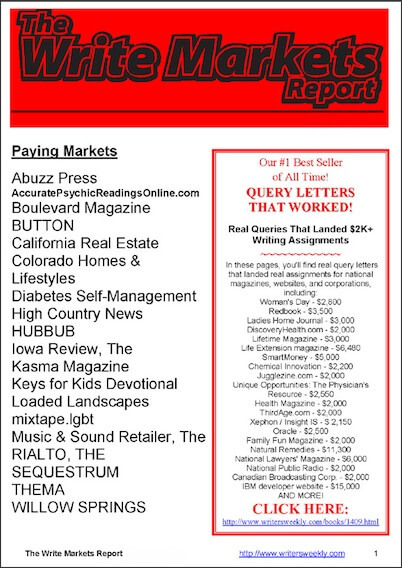 The newest paying markets anywhere and each editor's current needs! Landing only one assignment will pay for your subscription many times over! Delivered each month as a downloadable PDF file. Download the latest issue when you buy this subscription. This subscription-only publication is sent to you each month as a PDF file. All formats are printer-friendly. Instructions for the 24-hour short story contest. In these pages, you'll find real book proposals that landed contracts with these publishing houses: Simon & Schuster, Random House, Prentice Hall, Osborne/McGraw-Hill, MIRA Books, Music Sales Corporation, Berkeley Books and many more! Angela Hoy is the publisher of WritersWeekly.com and co-owner of BookLocker.com. WritersWeekly.com is a free online publication that features new freelance jobs and paying markets every Wednesday via email, as well as feature articles, freelance success stories, warnings about naughty publishers and editors, and more. BookLocker.com is a print-on-demand (POD) and e-book publisher that pays high royalties while offering low setup fees. Angela evaluates all incoming proposals and manuscripts and must, unfortunately, reject the vast majority of them. After seeing so many poorly-written and disorganized book proposals, she decided to create this guide for authors.